Concentrated solar power (CSP) plants, such as PS 10 and PS20 located in Spain, help supply clean electricity to thousands of homes; but researchers at MIT, in collaboration with RWTH Aachen University in Germany, thought they could do better. By studying the design layout and using a model similar to that of a sunflower, research shows that they could reduce the footprint of CSP plants and increase overall efficiency. Just outside Seville, in the desert region of Andalucia, Spain, sits an oasis-like sight: a 100-meter-high pillar surrounded by rows of giant mirrors rippling outward. More than 600 of these mirrors, each the size of half a tennis court, track the sun throughout the day, concentrating its rays on the central tower, where the sun’s heat is converted to electricity — enough to power 6,000 homes. 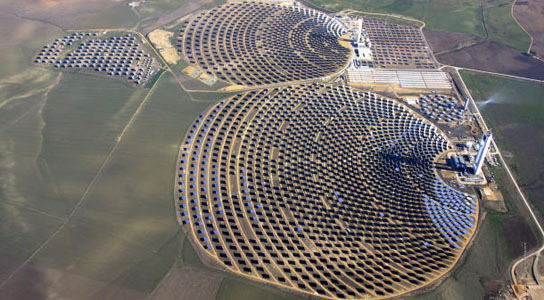 Be the first to comment on "Nature’s Sunflower May Help Increase Solar Efficiency in CSP Plants"